Lush Fab Glam Inspired Lifestyle For The Modern Woman: Best Dressed At The 2014 Golden Globe Awards. Best Dressed At The 2014 Golden Globe Awards. Celebrity media was all abuzz on Sunday, January 12th as Hollywood and TV celebrities walked the red carpet for the 2014 Golden Globe Awards. If you missed the televised award show and red carpet pre-show then we've got you covered! Read on to see the glamorous designer gowns, fabulous jewelry, gorgeous hairstyles and makeup and our picks for the best dressed actresses on the Golden Globes red carpet. Actress Amy Adams was the talk of the twitter verse in this two-toned, plunging neckline and backless, red Dior gown. Actress Sofia Vergara stunned in a sweet heart neckline and balloon skirt black Zac Posen gown which she accessorized with an over the top Loraine Schwartz necklace. Actress Kate Beckinsale in a metallic Zuhair Murad mermaid gown. Actress Julianna Margulies in a black princess-cut gown with gold coral pattern embellishments. Actress Margot Robbie in a custom white Gucci gown with a plunging neckline, thigh slit. Actress Kate Mara in a silver short sleeve gown with a cinched waist. Actress Naomi Watts in a shimmering gold Tom Ford halter gown. 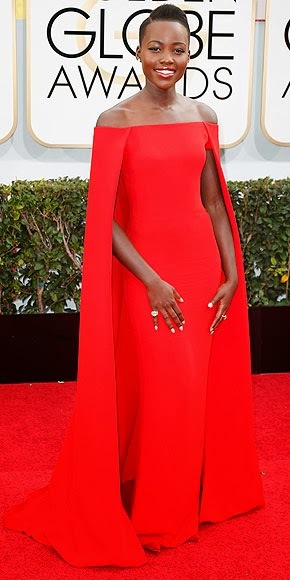 Actress Lupita Nyongo in a red, off-shoulder and caped Ralph Lauren column gown. Actress Jennifer Lawrence in was radiant in a white Dior princess gown. Actress Michelle Dockery in a gold embellished High-Low Oscar de la Renta gown. Actress Jessica Chastain in a black bustier-top gown with an elaborate wing motif. Actress Amy Adams wowed in her plunging neckline and backless Dior gown. Actress Emma Watson's red Dior gown wowed on the red carpet as it's backless design revealed blue Capri pants. Actress Robin Wright in a backless, halter gold gown. Actress Cate Blanchett in a black, backless lace gown. This 3 way angle of Actress Naomi Watts gold Tom Ford gown shows why she's on our best dressed list. Actress Zoe Saldana in a pink and black, floral embellished Prabal Gurung dress. Which Golden Globes red carpet style do you love? Share with us by leaving a comment below. Emma Watson. Like a good mullet...business in the front and party in the back. One of my favs was Margot Robbie she looked stunning in her Gucci gown. Coming to you from #sits. I'm happy to a part of the tribe with you.